Motivation is a curly topic that rears its head up in many different ways, or it could be said it seems to hide its head from us. The weird thing is that we are 100% motivated all the time, it’s just that we are motivated by different things and we end up applying our motivation to do different activities. One day we can be 100% motivated to be as productive as possible working on a project, the next day we can be 100% motivated to work on a project but also do some planning for the year, and the next day we can be 100% motivated to do as little as possible and take it easy. The challenge we face is to focus and maintain our motivation on the tasks we want to work on and the play we want to have when it’s play time. When it comes to creating game-changing ideas, we’re interested in creating them, but not always committed to do the work to create them. Being that it’s already February and many of my clients around the world have been lamenting that their motivation isn’t great (again, it’s really at 100% but just focused on something else other than their work), I thought I’d share six tips to help keep your motivation focused so that you can create some cracker ideas, or simply get more stuff done in your day. Sounds good? Six ways to focus your motivation and keep it where you want to help you get stuff done. Games focus our attention and motivation. One of the key reasons people play games is to receive boredom and for a sense of competition. The great thing is that we can borrow the principles that are used in gaming design and apply them to our work focus area. Thinking that no one plays games? A Saatchi & Saatchi study from a few years back indicated that close to 50% of the US online population play a social game once a day. By nature, we often shift our motivation to other activities once we encounter obstacles. Our lofty goal is brought down to earth as soon as things start to get tough, and we focus our 100% of motivation somewhere else. All because we failed to plan for the inevitable obstacles that would be coming. If < this specific event occurs > then < I will do this activity >. Another technique to help with obstacles is called “mental contrasting”. This is where we mentally rehearse working to achieve and succeed at a goal (taking time to rehearse the emotions of how it would feel), and then we contrast this with rehearsing having to work through obstacles, both expected and unexpected (once again taking time to rehearse the emotions of how it would feel). Mentally rehearsing this prepares us for what’s coming up and creates a gap of where we are and what we need to do get to our final goal. Psychologist use the term low frustration tolerance (LFT) to describe people who give up as soon as they encounter minor levels of frustration in a given task. One simple way to deal with this is to first rate level of frustration we may experience on a given task and what levels we are willing to persist and for how long. 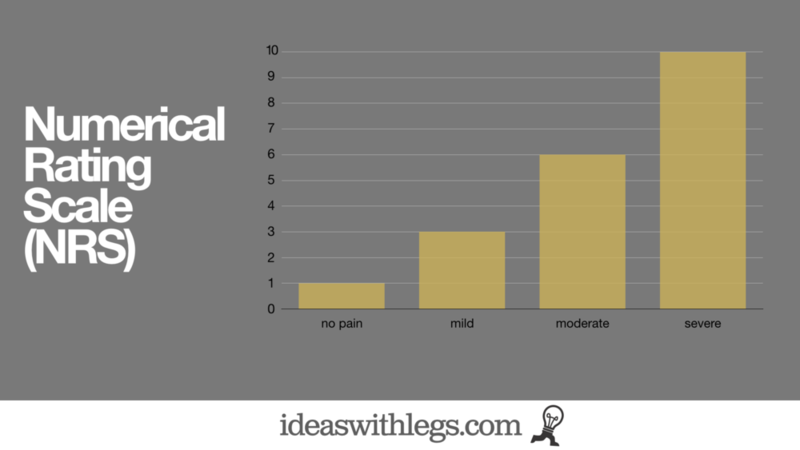 In hospitals, they use the Numerical Rating Scale (NRS) to rate pain levels. We can use it for our frustration pain. Let’s say I have a phone call to make to interview a potential customer about a new idea I’m considering developing. I need the customer intel, but I’m an introvert and I don’t like talking to people a lot. I might gauge the activity as being a 7 out of 10 on my NRS, i.e. severe frustration. As this is quite extreme for me, I might give myself some lee way, and allow myself a time limit, because it’s so frustrating. I will allocate 15 minutes to work on this task. If after 15 minutes, the task is too frustrating to continue I’m allowed to stop. I can then do the task that causes me frustration later in the day or the next day and gauge the level of frustration and see if I can extend the time. In most cases, by giving yourself a time frame of how long you have to “grin and bear it,” you manage to get through it, and interestingly the next time you do it, it gets slight easier to bear. The lesson is rather than force yourself to have to work on an severely frustrating task for hours, start with a smaller time frame in the minutes, measure the discomfort and slowly build up your frustration tolerance. Let’s say that your LFT tolerance is increasing but it doesn’t feel like it’s increasing fast enough for your ambitious mind. That’s when it’s time to utilise another powerhouse of modern psychology’s arsenal - Acceptance Commitment Therapy (ACT). In very simple terms, ACT has been developed to enable people to deal with uncomfortable thoughts in a quick and swift manner to enable us to move on with our life. Rather than trying to debate with our minds the pro’s and con’s as to whether our thinking is right or wrong, the focus is on accepting those thoughts, making room for them and focusing on the outcome and task at hand. ACT is not about trying to eliminate thoughts, it’s about making room for them. We call this expansion. Thoughts in many ways are abstract symbols, be them a bunch of letters or images, they are not necessarily fact. By understanding that thoughts are just made up, we can use some tools to play with these made up thoughts in order to reduce the power they may have over us. Once again, the aim is not to remove them, just reduce their power whilst accepting that they are likely to hang around. A good analogy to help explain this is to think of a next-door neighbour in a house using a leaf blower. We’re not trying to stop the noise the leaf blower makes, but reduce its volume by putting in some ear plugs, so to speak. We can still hear the leaf blower, but we’re not as affected or distracted by it as before. Singing the thoughts and feelings to the tune of happy birthday. 1. Saying to yourself either aloud or internally “Right now I’m having the thoughts and feelings of __________, I don’t like it but right here, right now I have room for them”. This is a really powerful way of building our expansion muscle. That is to make space for these thoughts. By using those words, you are simply accepting them and the situation and making room for them. By making room for them, we reduce the amount of mind space trying to fight the thoughts and we are free to focus on something more productive or useful. Let’s imagine I’ve just had a tough conversation with someone and I feel like eating to get over it, my words might be “Right now I’m having the thoughts and feelings of being angry, feeling stupid and wanting to eat something sweet. I don’t like these thoughts and feelings but right here, right now I have room for them”. You could repeat this until you feel as if you can move on. 2. Singing the tune of happy birthday whilst using your unhelpful thoughts and feelings as the lyrics to the song. For example, imagine I just had an argument with Lisa, and now I’m feeling a bit down and feeling like eating some comfort food. The lyrics I can use might be “I feel bad about Lisa, I want to eat something sweet, I want to eat something sweet”. I would sing this to the melody of the happy birthday tune. If you want to explore this technique more, I actively encourage you to read the book called “The Happiness Trap” by Dr. Russ Harris. This book is based all on the ACT techniques and is written very clearly, simply and eloquently. Definitely worth a read. Creating structures can help to force us to do work when we don’t feel like doing the work. For example, I used to watch television, and I found too often I would watch television because it was too convenient to turn on and start watching an average show. Now, watching television or a movie is not necessarily bad if you want to do it and you’ve achieved all of your activities you have goals on, but for me, I had a goal to play more piano, and television was getting in the way. So the structure I put in place (though a bit extreme) was to remove the television. I can still watch a Netflix movie on my tablet, but I only do it when I really want to do it, versus being distracted by it. Some other structures you can have is creating accountability around your goal. There are some great free websites that can help you along the way. A favourite of mine is Stickk.com. In essence you declare a goal, nominate a referee (who will assess whether you achieve your goal), create a date and milestones for progress, and finally, you nominate an amount that could be deducted from your credit card and sent to a person of your choice if you fail to achieve your goal. Bottom line is, when people have money on the line, people get stuff done. If a website isn’t your cup of tea, have an accountability partner such as a colleague, partner or like-minded person, who wants to see you succeed in life. Another powerful technique is to use a Gantt chart. 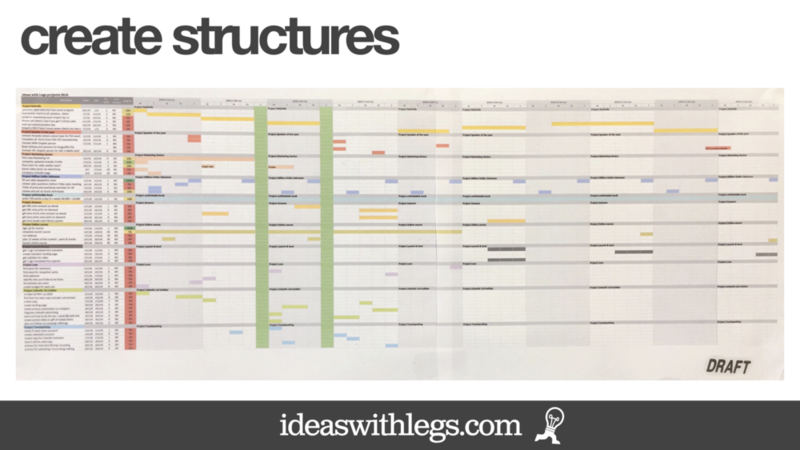 A Gantt chart can help by acting as a scoreboard, but also by giving you a structure of what you to do, by when. It can also help in time planning. Personally, I find I am much more focused and have increased traction towards my chosen goal. Try using weekly activities focused on a 12-week project with various sub-goals to make the project easier to achieve. Finally, we have behaviours. Behaviours are the root of achieving goals, because it’s how we behave at the end of the day that determines whether we actually move closer to our goal. To help you, it pays to identify the key observable measurable behaviours that you might need to achieve your goal. For example, if we use the goal of wanting to lose 5 kg in 4 weeks, I could identify the critical specific behaviours I need to stop, the behaviours I should continue and the new behaviours I can start. Whatever your goal might be, there will be some specific measurable behaviours that you will need to change and start to help you get there. Try writing them down and see how much it helps you to keep you motivated on the task you truly want to work on. I really hope this helps you get that motivation focused on all the right things for 2019. If you have any questions or comments, feel free to reach out.